Wine and Hors d'Oeuvres Reception and Book Signing: 6:00 p.m.
Special Admission includes one hardcover copy of The Scandal of Money at a 29% Discount! 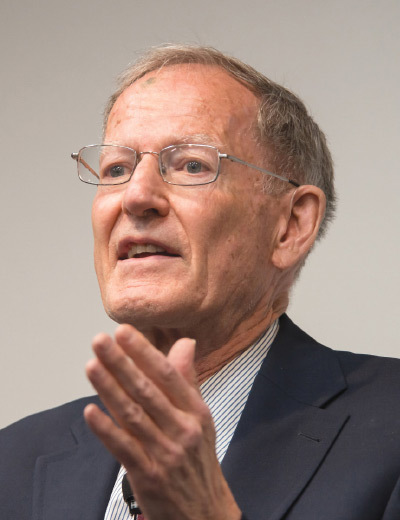 George Gilder is Chairman of George Gilder Fund Management, host of the Gilder Telecosm Forum, Senior Fellow at the Discovery Institute, a founding Member of the Board of Advisors for the Independent Institute, and author of the acclaimed, new book, The Scandal of Money: Why Wall Street Recovers but the Economy Never Does. The author of scores of books and articles, his most influential book is Wealth and Poverty, which makes the economic and moral case for the tax reductions and economic growth of the "supply-side revolution." Drawing on his new book, The Scandal of Money: Why Wall Street Recovers but the Economy Never Does, Gilder will explain why America needs a monetary system free of government monopoly and safe from the manipulations of a central banka system in which gold-based money and blockchain technology can work in concert to revive Main Street rather than enrich the political elites of Wall Street. Nothing less than the adoption of real money, according to Gilder, can fulfill the amazing potential of the information economyand nothing less can make good on the promise of the American dream.